Banpresto will release the following game prize goods in February and March 2013. New series WE ARE TEAM ROCKET will begin. Many thank you for sharing images to Fujiya Singapore@Facebook. Just let you know interesting interview comment of Gamefreak Masuda-san's recently. In Famitsu No.1297 published 10 October 2013. Interviewer "Could you please tell us Pokemon X Y story a little bit ?" 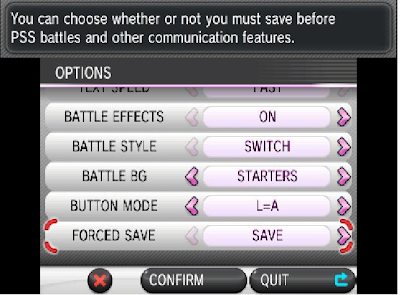 Masuda-san "We can't reply it at the moment. X-axis and Y-axis as known as math lesson meanings are also included in title X and Y. We will see the common point where zero part (X-axis and Y-axis crossing point) from X and Y different view angle. It's weighty theme. Like we can see same event and same phenomenon differently by different view angle." Sample pages (in Japanese) are uploading here. You may also like to read Nintendo CEO Iwata-san Asks in English. Will edit the contents and upload some images more soon. 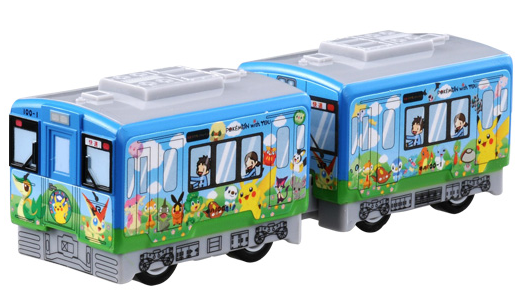 Takara Tomy ARTS (TTA) will release the following candy toys called Get Collection Candy XY on 11 November 2013. 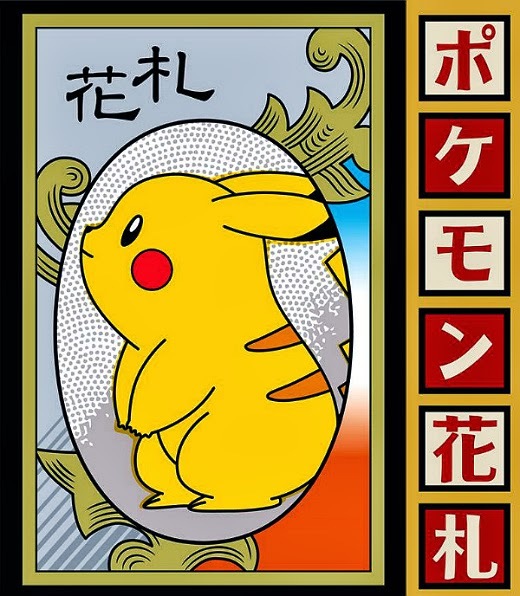 Pokemon Movie official site uploads the first teaser trailer for next year Pokemon Movie 17. 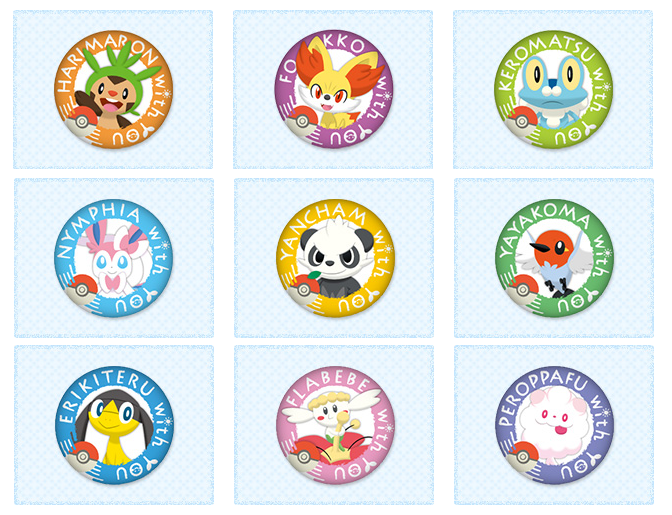 Tentative title is Pokemon XY at the moment. 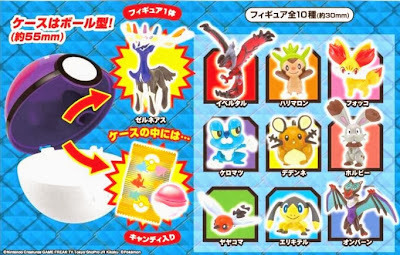 [ Reposting ] PokeCenJP reveals the details Pokemon Time #6 today, it was not featuring RS. Here is corrected and reposting. 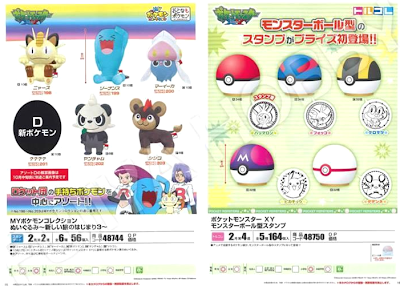 PokeCenJP will release the following Pokemon Time series #6 merchandise on 21 12 October 2013. Others are stickers, 3DS hard case, 3DSLL hard case and 3DS LL hard pouch. 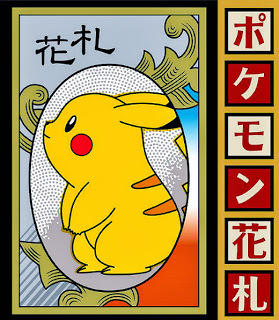 The Pokemon Company will release Pokemon HANAFUDA (Japanese traditional playing card game, please see Wikipedia) card game in Novermber 2013. Also launches special site, it will update on 14 October 2013. 1. 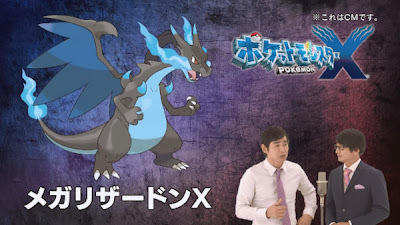 In aired Pokemon TV Anime 'The Origin' today, Mega Charizard X was announced. 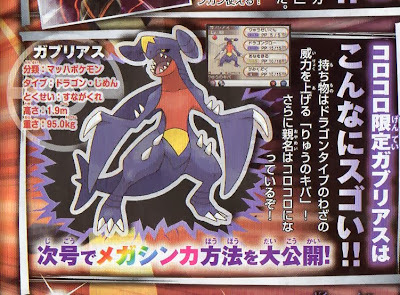 It's exclusive Pokemon in X, will be evolved from Charizard with CharizarditeX. 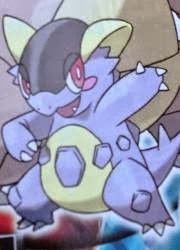 Type is Fire/Dragon, has ability of Tough Claws. 2. According to tomorrow publish girls magazine Chao from Shougakukan, Pokemon featuring page is posted in 2ch. 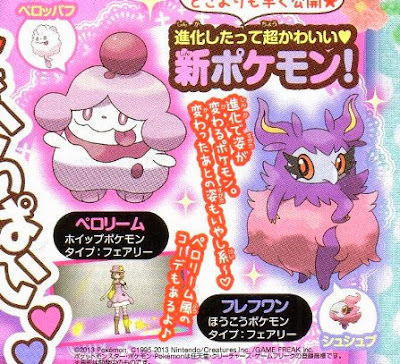 Swirlix evolves to Slurpuff ペロリーム and Spritzee to Aromatisse フレフワン, type is fairy same as before . 3. Mega Charizard X news reminds me that upcoming CoroCoro magazine contents. 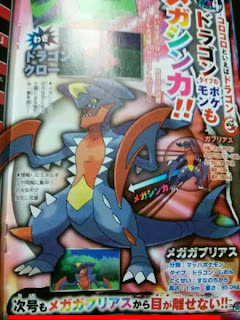 In October CoroCoro of Mega Garchomp page, caption says 'You can't take your eyes off from Mega Garchomp next CoroCoro too !!'. Very wondered that why do they feature Mega Garchomp more, we've already got info, anything else ? 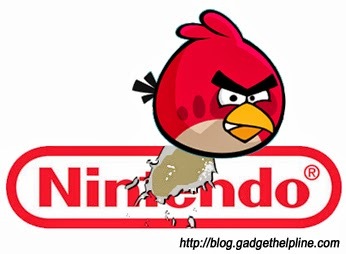 when I saw this. 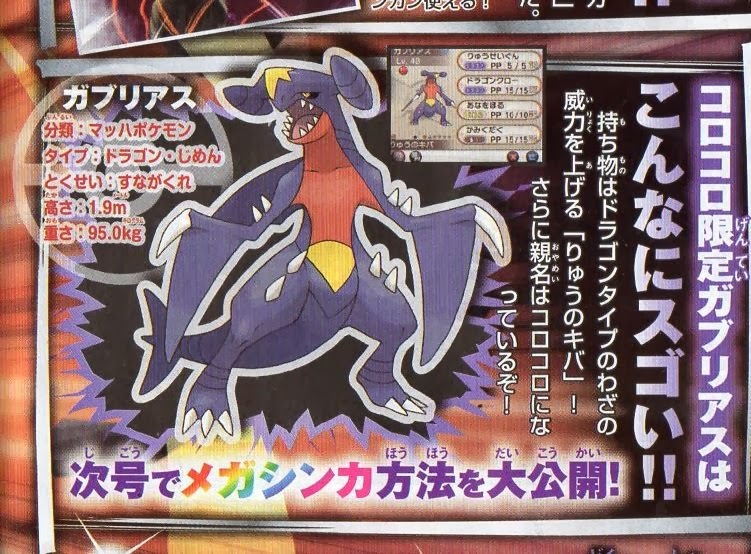 Do you think is it same as Charizard, Mega in X and Y ? 4. 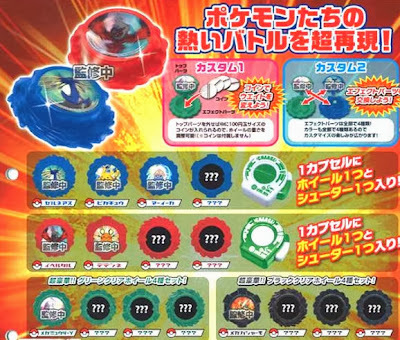 Just new Pokemon info from leakers. 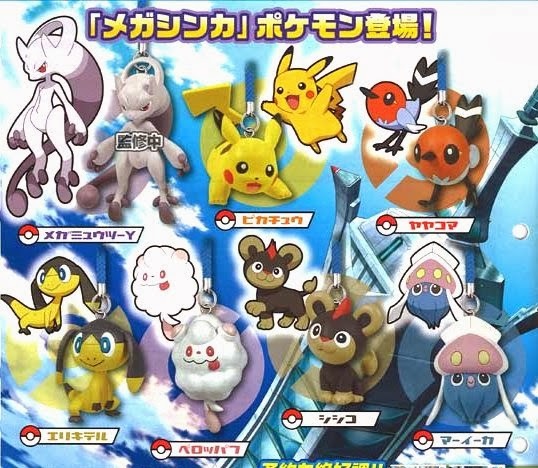 They found Espurr which 1st evolution of Meowstic and Fletchinder which 2nd evolution of Fletchling. Please check these links if want to see. Have you read previous article ? Anyhow here is merchandise news. Takara Tomy ARTS will release the following capsule toys in January 2014. 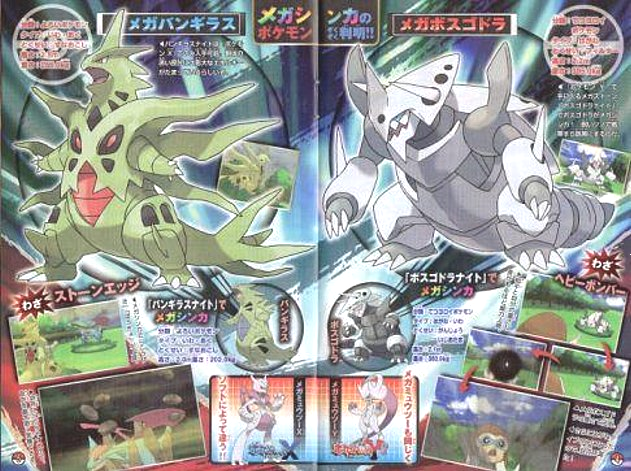 [ BREAKING NEWS ] XY Playing Started in Canada ? According to 4channel posts, someone already started XY playing in Canada 10 days ahead, some pics are uploading to the following links. AAPF will NOT post and follow these things, please see it yourself with your own risk if you want. Thank you for your understanding and thank you for worldwide release. 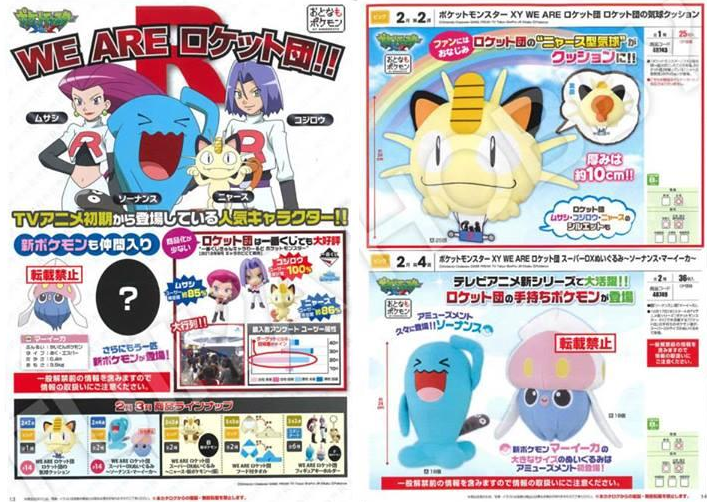 Shougakukan publishes magazine Pokemon Fan Vol.32 yesterday. No special XY info on attached XY game guide (booklet). Next Vol. 33 will out on 20 November 2013. Merchandise freebie is Pokemon BW Swing strap figure Sylveon and Rookie Pokemon Tretta Flareon. 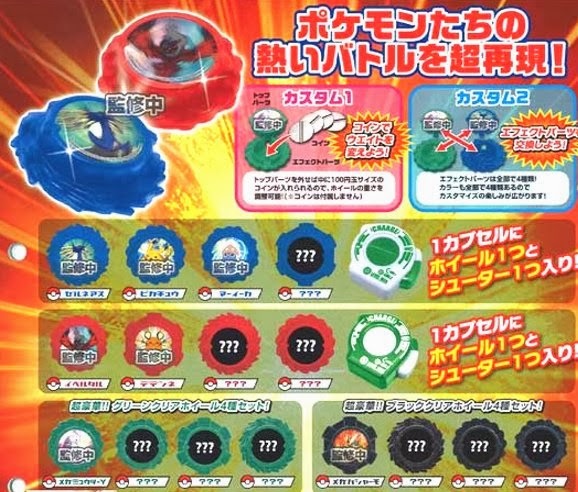 Bandai will begin Pokemon Kids Promotion 1details as follow. Schedule : 14 October to 31 December 2013 (Phase 1), Phase 2 will run in January to May 2014. Uploaded Pokemon Kids XY1 color pic.